My recent post Nut Meets Sledgehammer looked at the case of Ross Loraine, a resident of Sunderland who was cautioned by police for an offensive tweet about a tragic accident in Glasgow. A subsequent article in the New York Times shows that in some ways, Loraine got off lightly. 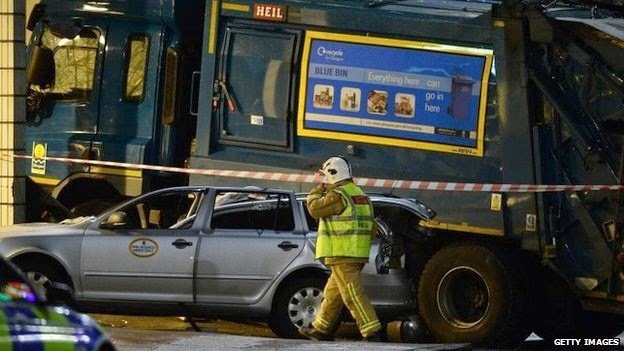 Aftermath of the lorry crash in Glasgow. I watched these shame campaigns multiply, to the point that they targeted not just powerful institutions and public figures but really anyone perceived to have done something offensive. I also began to marvel at the disconnect between the severity of the crime and the gleeful savagery of the punishment. The offender receives a deluge of replies from angry strangers, and sometimes more serious consequences, such as loss of a job or threats to his or her physical safety. The target of a Twitter-shaming is marked indefinitely, as a simple Google search reveals the episode for anyone who cares to look. Finding a new job or romantic partner becomes extremely difficult. The whole piece is well worth reading. It raises the question of how society should react to offensive remarks on social media. The effects on Loraine have been comparatively mild. Under UK employment law, it is more difficult to fire someone for an offensive tweet than it would be in the USA. It appears he has exercised his right to be forgotten under EU law, and had results removed from Google and other search engines. The law in the UK was daft enough to make this a police matter, but at the same time it offers some protection. News reports have not mentioned Loraine having to fear for his personal safety. His tweet was directed specifically at Glasgow, which reduces the likelihood of an international mob raging against him. Glaswegians themselves (including some of my close relatives) can be a combative lot, but also pride themselves on a sense of humour, and have more important concerns than a young twerp like Loraine. If Loraine had made his offensive remark out loud in a pub, probably a handful of people would tell him he was being an idiot, and that would be an end of it. If his friends were particularly offended, some might get angry and shout at him for a bit, or stop speaking to him altogether. I think most of us would consider that a fair response. We have all said stupid things from time to time, especially when we were nineteen years old. Reasonable and proportionate annoyance from people we know is an opportunity to learn. The trouble is, the Internet in general and Twitter in particular enable vastly disproportionate responses from large groups of strangers. They allow thousands of people who have a particular axe to grind, or just find it entertaining, to arbitrarily take up the cause of shaming one individual. The result is public humiliation, reminiscent of the pillory and the stocks. The NYT piece points out that these punishments were abandoned over a hundred years ago, largely because they were felt to be too cruel for even serious criminal offences. I previously said that our legal norms lag far behind what the Internet makes possible; our social norms need to advance as well.